Rahsaan Thomas has been collecting stories from inmates. Emile DeWeaver has just finished doing some yoga. "I'm feeling ready for the world," he said during a phone interview. That might not sound exceptional, except DeWeaver is an inmate at San Quentin State Prison. San Quentin offers a yoga class every Thursday, but DeWeaver and several other inmates have started practicing independently and perform daily routines in order to center themselves. It's one example of how incarcerated individuals practice self-care. And now DeWeaver, along with fellow inmate Rahsaan Thomas, are helping launch a new multimedia project to share prisoners' personal stories of self-care, strength, and survival. Care Not Cages will include the release of a zine, featuring stories, poems, essays, comics, and illustrations created by currently and formerly incarcerated individuals, as well as a film that examines self-care practices behind bars. The goal is to give insight into both the harsh realities of struggling with mental health problems in prison and jails as well as the strategies inmates have developed to cope with them — or what DeWeaver calls the "knowledge of how we heal ourselves." "It's a bridge to society," said Thomas. "It's an awakening to let people know what's going on in here, and it's a chance for healing and transformation." All of the pieces featured in the zine will be from contributors in San Quentin and jails in Alameda County, and the film is being shot in San Quentin. Care Not Cages, which is being produced in partnership with Decarcerate Alameda, is just one project of Prison Renaissance, a nonprofit founded by DeWeaver, Thomas, and, fellow inmate, Juan Meza. It's dedicated to publishing essays, stories, poems, and visual art created by incarcerated individuals. Thomas said prisons, by design, keep the incarcerated "out of sight and out of mind" from the rest of society. It's easy to forget that prisoners still retain personal agency in spite of the limitations imposed by their surroundings. "In prison, you are cut off from the world with the worst thing you've ever done just hanging in the air," he said. "Our hope is that, through art, we can remind the world of our humanity, and not be hampered by the limits of our incarceration." 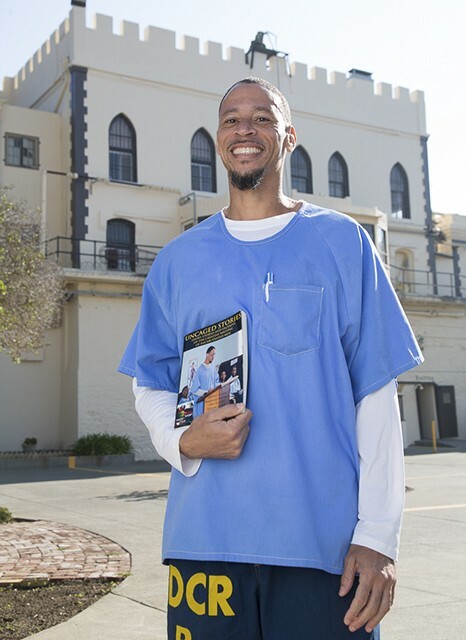 Thomas, who is the project lead from Prison Renaissance, has been collecting and sifting through submissions sent from Santa Rita and San Quentin. "We got a grip of them," he said, laughing. The stories talk about meditation, yoga practices, writing, reading, exercise, cooking, and many other activities that we may take for granted as relatively inconsequential, but in a strenuous environment like prison take on a much more significant weight. "Incarceration doesn't help mental health," Thomas said. "It exacerbates it." He recalled his experience at California Men's Colony, a correctional facility in San Luis Obispo. "There was a spike in suicide while I was there," he said, "and if there was suspicion that you were suicidal, they would isolate you and take everything including your clothes. You would be in a cell in a smock with a mattress and no sheets." He concluded, "It's a hostile environment. Plain and simple. And not a place that deals with the root causes of violence or mental disorder." Tash Nguyen of the Ella Baker Center for Human Rights and project lead for Care Not Cages for Decarcerate Alameda, hopes that the project will show "how incarcerated individuals are surviving in the face of isolation, abuse, and neglect that occurs behind bars," adding that there has been a recent spike in suicides in Alameda County jails. Thomas, DeWeaver, and Meza, cofounded Prison Renaissance in 2016 with the hopes of opening more channels for incarcerated folks to have their stories heard, as well as provide a platform for them to get meaningfully involved in social justice movements. The organization is sponsored by Impact Justice, a nonprofit dedicated to bringing about restorative change in the criminal justice system. Prison reform and its intersection with mental health care has been a hot topic in national discussions, and especially within Alameda County, but so far there has been a distinct lack of voices from the incarcerated in the discourse. "Solutions for communities need to be coming from communities," explained DeWeaver. "How do we think any kind of reform can work without centering the voices of those affected?" Decarcerate Alameda is a coalition of county residents that formed in 2015 to oppose the construction of a mental health treatment unit in Santa Rita funded by California Senate Bill 863. Despite those efforts, funding was awarded and the county is in the process of contracting construction firms. With this development, the coalition has shifted its focus to pressuring the county board of supervisors to create more community-based mental health services and intervention points. Holly Delaney Cole, a member of the coalition, noted that in the process "it's important for the coalition to, when possible, let those most affected to lead." Thomas is heading the film aspect of the project, shooting and editing with equipment from San Quentin's media center. An especially fascinating element will cover inmates who play Dungeons & Dragons. "I want to examine the mental health benefits of playing D&D, how it provides an escape, and how it brings different people together," said Thomas. DeWeaver added that prison is a "bizzaro world," dictated and separated along racial and cultural lines, emphasizing that any activity that can transgress these boundaries has significance. "These gamers," he said, "actively try to step outside of racial divides and prison politics. Who doesn't like D&D?"